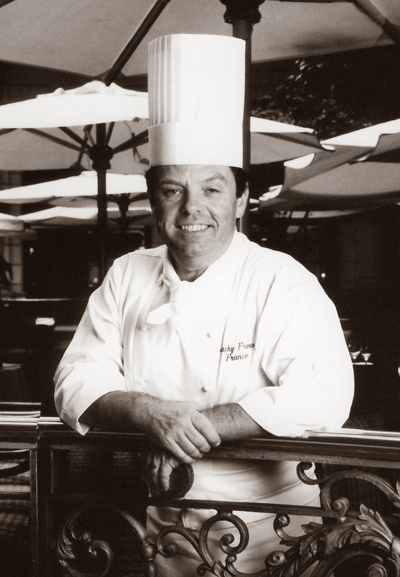 Jacky was the candidate chosen by the profession to represent France for the very first Bocuse d’Or in 1987, and he proved to be the right man. He won the competition hands down thanks to a concentration and determination that enable him to control his emotiveness. But then he is a seasoned competitor! He won his first culinary competition, the Victor Michon Cup at Arpajon, as far back as 1963, when only an apprentice at the Trois Soleils at Orly Airport. He has since won a string of victories (a good dozen) in both individual and team events in a rich career as chef. He mostly works for Joël Robuchon as Head Chef in various Parisian establishments and brought a solid gastronomic name to the Hôtel Lutetia and later to the Grand Hôtel-Café de la Paix. Since 1998, he has placed all his energy at the service of the Mutuelle des Cuisiniers de France and the Fondation Léopold Mourier, where he is Managing Director. This is his way of helping to gain recognition for the hard work accomplished by hundreds of chefs, many of whom are indispensable in upholding the quality cuisine for which Jacky Fréon fights tooth and nail! This spirit has won him the title of Meilleur Ouvrier de France honoris causa. Now retired, he still often works with underprivileged youth and migrants, for whom cooking is a profession that restores hope and a bright future. He willingly partners with the Fondation des Apprentis d’Auteuil.